Whether you spend your profession behind the wheel, in the metal shop or in the dirt, you require quality gloves that can keep your hands in working condition. There are different types of gloves for different types of jobs to give you the balance flexibility and protection you need to work efficiently and safely. We’ve outlined which features to look for when shopping. Driving gloves provide drivers in the transportation industry with better grip of the steering wheel, with the ultimate goal of improving control of the vehicle and safety. There is a wide range of glove types available that are designed to enhance hand tactility while driving. Often, it’s the driver’s personal preference that helps them decide which type of glove is best suited for them. Most commonly, leather is the preferred material for driving gloves, as it provides a soft, pliable feel, with pores and grain to improve gripping capabilities. Popular types of leather for driving gloves include cow, pig, goat and deer leather. Synthetic leather is also available. Another important feature to consider when selecting driving gloves is the construction of thumb. A keystone thumb, the most ergonomic design, is sewn separately onto the palm area for maximum flexibility. A wing thumb is angled without a seam to increase durability and comfortability. The straight thumb is the most traditional design, which places the thumb perpendicular to the wrist. Different types of welding require different types of gloves for maximum hand and wrist protection. Professionals who are involved with stick welding, for example, should consider the thickest material glove to protect from the high level of spatter. They might also consider a glove that features aluminum reinforcement on the back of the thumb to help deflect radiant heat. MIG/TIG welders might consider a lighter-duty welding glove. Welding gloves in general are constructed of leather and feature a lining such as a foam, wool, fleece, cotton or Kevlar® for added heat protection. 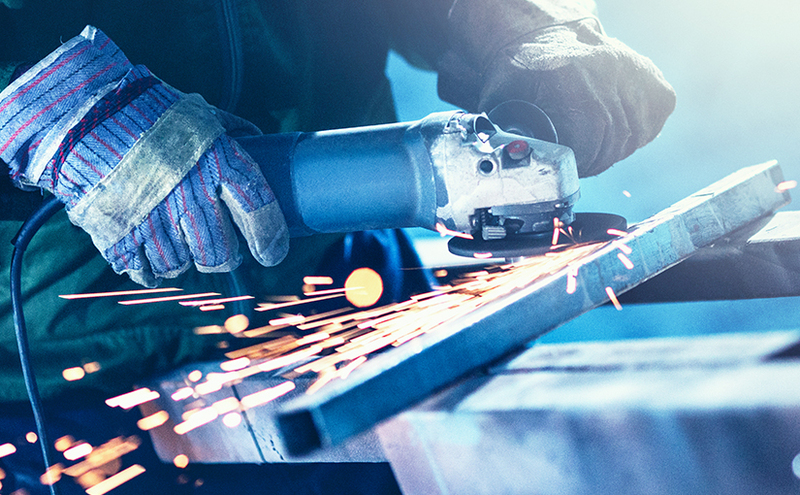 Welders should always wear flame-resistant gloves that feature cuffs to protect their wrists from potential spatter. Landscapers rely on their hands for everything they do—it’s critical to keep them safe on the job. Knit gloves are an ideal product to provide landscapers breathable, flexible and grippable hand protection. String knits are a popular cotton/polyester blend glove used in the landscaping profession. They’re breathable and comfortable, and are available in different gauges for varying levels of protection. Cotton knits are another great option for lighter-duty protection and can include features such as dots and coating for enhanced gripping and heat resistant lining for added safety. Gunn pattern gloves, which feature a seamless back and a single “gunn” seam at the base of the middle finger, are a very comfortable option for landscapers. They can feature materials such as a leather and Kevlar® and often include rubberization and cuffs for enhanced safety. Gunn cut gloves are also available with insulation. Start by measuring the circumference of your dominant hand by pulling a body measuring tape around your palm, just above your thumb. Measure three times to make sure you have the correct calculation before you select your size. If your gloves have adjustable wrist bands, make sure you pull them snug enough to prevent any material or debris from getting in, but loose enough that you don’t cut off any circulation. If you can force one pinky finger between your wrist and the band, you’re good to go. US Standard Products has a wide selection of top quality gloves that provide safer and smarter protection for Manual Labor and Civic Maintenance Professionals. Visit our website and download our free catalogue to start exploring your options. See all the other ways US Standard Products is making your world a better place by visiting us on Facebook, Twitter and LinkedIn.